I finished my first weaving project, which started out as a test run but now looks like something. My first thought was, I can always use it as a table runner. But while knotting the fringe, I had the piece draped across my bare legs. Mmmm! So warm! So maybe it is a scarf or a small shawl? I obviously have some learning to do. The edges are not even, especially where I got in a hurry. Also, there is one missed warp, which of course stands out like a neon sign in outer space. All in all, I think it is not a bad start, though. 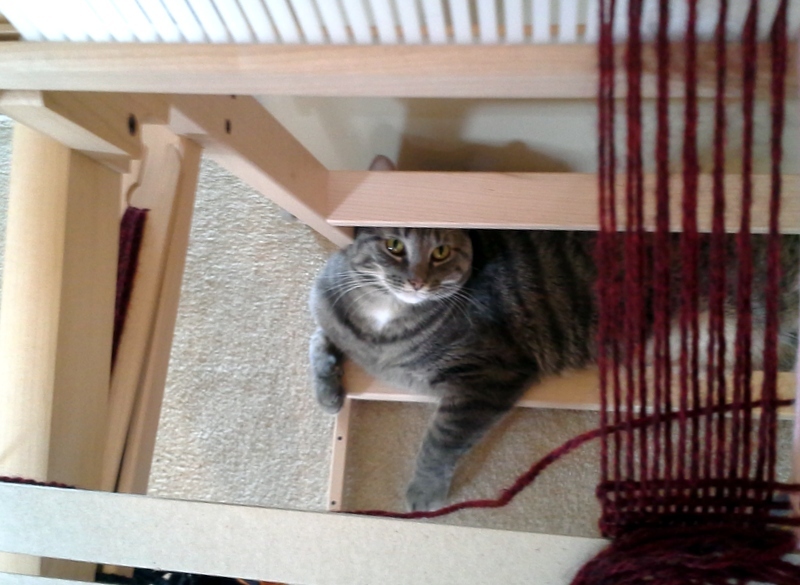 Of course, I had some assistance from the *other* helpful weaving cat in this household. Maybe Finn thinks the scarf/shawl is for him? 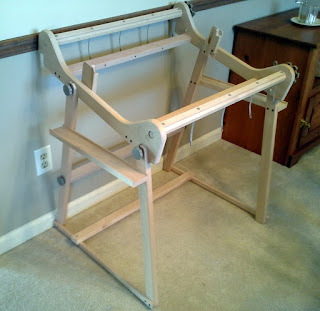 I finally got around to warping the new loom, and I did it BACKWARDS. It took me HOURS to get this far, and it is wrong, wrong, WRONG! And it left me with about 40 12-foot sections of yarn after I undid all my hard work. Finding a good place for the warping peg was another challenge. No matter how or where I situated the peg, it had a tendency to pop off when I was about two-thirds of the way done. GRRR!!! I finally gave up on making the tension tight across the warp and concentrated on making it as even as possible. And still the peg almost popped off again. I think I will invest in a warping board. Since I was warping solo, I tried to work out a method whereby I would not need an extra set of hands for winding the warp. None of my ideas worked very well, but I was finally able to find instructions on the Ashford web site. 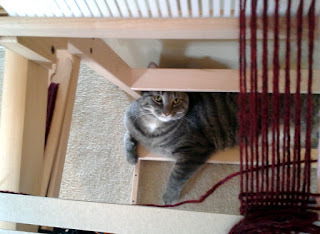 However, not wanting to wind up with another 40 12-foot pieces of yarn, I refrained from cutting the warp threads until the warp had been wound. Since I was using scrap yarn to practice with and had already ruined a bunch of it warping BACKWARDS, I had to resort to mixing yarns. The burgundy yarn is Elann Peruvian wool, the pink Lamb's Pride, both ostensibly worsted weight but not the same at all. So while tying off the warp threads, I bunched them by color. This led to them being rather spread out. I'm not sure how much of a problem this is, but it doesn't look ideal. Another result of tying the warp threads off by color is the knots turned out rather bulky, making the woven fabric bulge. Again, not sure if this is a big deal, but in the future, I will include fewer threads in a bunch. FINALLY, I was able to weave. A recurring problem is the shed - the yarn is stretchy enough that I keep losing tension with one color or the other, which makes the shed too small. The lack of tension also causes the heddle to lose its footing. And it is taking me a while to get the knack of avoiding draw in or loops along the selvages. On the plus side, I have been able to salvage the original warp yarn by spit splicing the pieces together. The class I took gave me a false sense of weaving competency. Doing everything myself with no one to look over my shoulder is quite the opportunity for learning. Originally, I planned to start warping with crochet thread and create a bunch of samples with different weight warps and wefts. Instead, I had to resort to worsted and now must simply practice, practice, practice. This stage may go on for a while. Stay tuned! 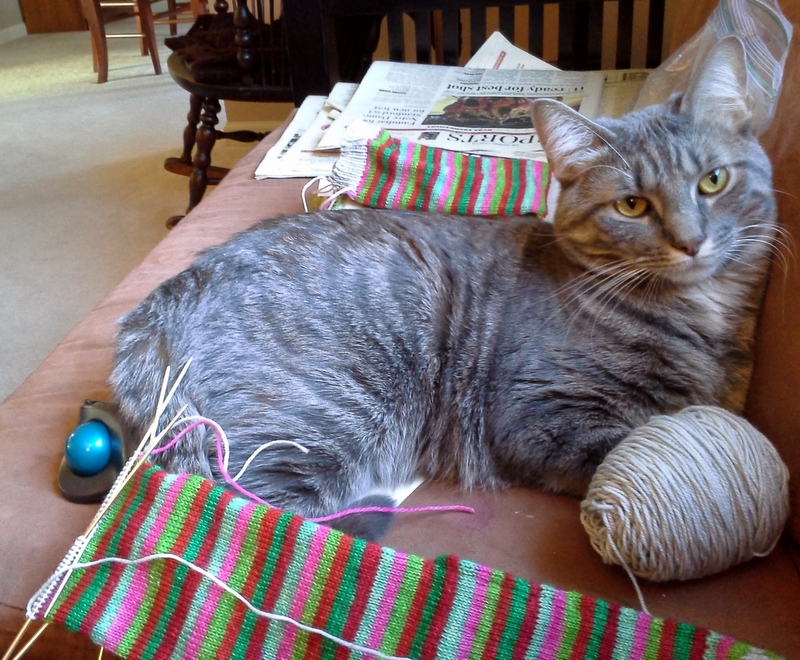 Someone started the hashtag #helpfulknittingcats. I had to contribute. Today I started the hashtag #helpfulweavingcats. At least Beau is learning to leave the yarn alone... for the most part. It's an Ashford rigid heddle loom (24") with a stand, purchased from the Weavers Loft. The waxing and assembly took me three hours on Sunday, and unfortunately I have not had the time since to thread the warp and start the weft. Soon, though, very soon. I have LOTS of ideas!